Zhi-Ming Ma is a Professor at the Institute of Applied Mathematics (AMSS, CAS) and fellow of the Chinese Academy of Sciences. He has been President of Chinese Mathematical Society, Chairman of the Organizing Committee of ICM2002 and a member of the Executive committee of IMU. 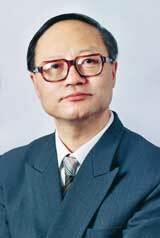 He is currently President of the Chinese Society of Probability and Statistics. He has obtained a number of awards and honors, among them, the Max-Plank Research Award,1992; the Chinese National Natural Sciences Prize, 1993; Invited Speaker at the International Congress of Mathematicians, 1994; the S.S. Chern Mathematics Prize, 1995, and Honorary Degree of Doctor of Science, Loughborough University, U.K., 2004. His research is focused on the study of Random Complex Networks and Information Retrieval.